Poetry. Paper, Perfect Bound. 62pp. The pieces that make up Kibbe document a life spent journeying “Between Two Worlds”: the author’s America and the Lebanon of her family heritage. In Porterfield’s vision, people and places long departed can be conjured back through memory and language; “the land of the father is remembered / by the child.” That language cannot perform its function unless it can consider honestly and unapologetically the political, social, and spiritual rifts that seem to divide real people. We recognize the people in these poems even when they are distant from our homes and our minds: the fathers and mothers, the dictators, even the stranger driving the taxi through Beirut. Thanks to Porterfield’s healing art, we find ourselves with them in the end, in a shared space where reconciliation and compassion are our only options. Susan Azar Porterfield movingly portrays the seeking of cultural roots in Lebanon and in her father’s former village of Kousba. What she offers is no less than a thrilling narrative of how we come to love the world, even among maimings, wars, and threats of translated confusions. These poems are political in the deepest sense—they thin the membrane between personal and public, demonstrating with clarity, grace, and even restraint, the reciprocity between one’s interior map and boundaries drawn in ink or blood. “The old country. No one says that now,” she writes. The “old country” for her is necessarily the new, and the new, the old. It’s Azar Porterfield’s profound love of place that grounds these poems in the viscera, where we are tender and most alive. Acknowledging her heritage, she says in “Chicago Love Poem,” “If I’d written Your eyes are two palm groves / at the hour of dawn, / the palms would be roots in my bones.” Still, you can’t remove from her the city of her birth: “I was born in Chicago, and this is what I know: / That without you, I’m a platform of the El / wind-iced at 3:00 a.m. / That together we’re a convertible ride / along Lakeshore Drive in June.” These poems are thick with the thinning of distance not only between cultures but between this and that, I and Thou, and self and other. The locus of transformation is the primacy of love. heart of the Midwest, I’m making kibbe. as I do, by its Arabic name. allspice, butter-browned, scent the house. of women who look like me. and in the dish made word. bread, wine can send us reeling. Someone is always making kibbe. Susan Azar Porterfield was born in Chicago and is currently a Professor of English at Rockford College. She has studied and taught in London, and has taught as well in Lebanon. She edited Zen, Poetry, the Art of Lucien Stryk (Ohio University Press) and has published several articles on Stryk’s work, including a profile of him for Poets and Writers magazine. 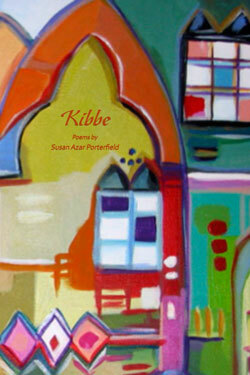 Kibbe is Susan’s second Mayapple Press publication; her first, In the Garden of our Spines, was released in 2004.